Meets educational demands. Creates endless campus possibilities. Better access to student or staff information. 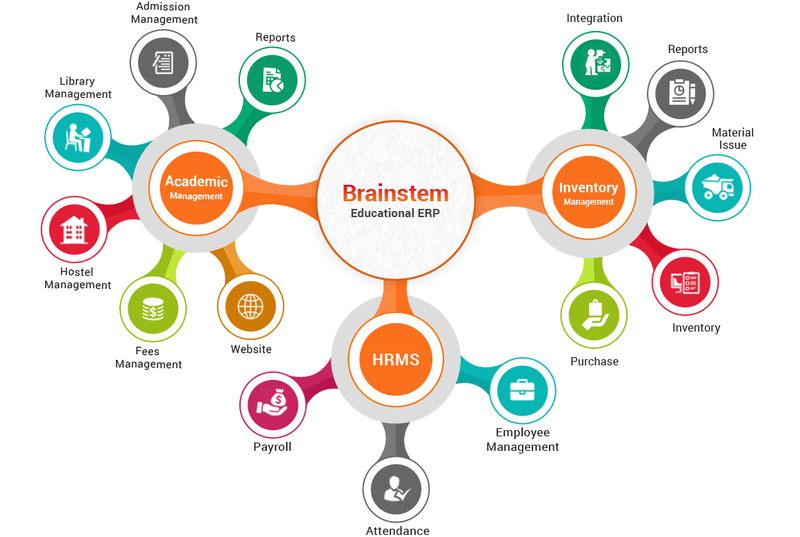 Brainstem – Education ERP software is a novelty solution of AES Technologies Private Limited. The product aims to provide the technological support for educational institutions by automating the complex data management process. When the demand for the education becomes higher, the institutions face difficulties in handling the activities including admissions, section wise student information, students or staff attendance, student examinations, results, course management, and records on passed out students. Our end to end education ERP solution is designed to suit any educational institution by automating their campus administration, student or staff management, attendance, inventory management, Finance and payroll processes. The brainstem is a web based software that requires no installation and works seamlessly on the web browser with Internet connection. Our campus management software acts as a campus information system by providing excellent access to the student data, empower staffs to access the HR or payroll features, allows sharing of information to internal or external locations, build user relationships and enables clear communication between management, staffs, and students. Automated attendance management system enables to maintain staff attendance with accurate values. Hostel management organizes all hostels in the campus by managing the hostel admission, reservation of rooms, mess, hostel inventory and hostel fee. Library management controls the books, e-books, journals, magazines, newspapers, periodicals and other documents in the campus library by maintaining a catalog. It keeps track of the book transactions, book availability, late returns, and also allows finding the status of library assets. Course management allows managing the courses of colleges and universities along with its duration, fee, course in-charge and other parameters. It also allows to control the course of admission, time-table, enrolled students, course facilities, and more. The staff management process in brainstem tracks the staff attendance with the integration of the biometric device. It helps to process staff payroll, monitors employee performance and facilitates in employee self-service. It allows the users to manage their leaves and permissions. Inventory management in Brainstem manages the entire campus inventory management lifecycle by controlling purchase, stock transfer, stock consumption, stock details, capturing stocks and managing stock availability. Brainstem maintains a centralized database for storing of student or staff information, administration, payroll, HR, accounts, students or staff attendance, course information, and staff or students performance — this allows the authorized user of any departments to access the student or staff information. AES education ERP allows staffs to add or update the student/ staff attendance, grades and provides access to accurate, real-time information whenever required. Enables the management to handle the available resources and funds efficiently and take effective business decisions. Brainstem student information system captures the personal and academic information of students during admission. The module obtains the scanned copies of Student’s photos, previous educational certificates and other required proofs before admission. The module generates a unique roll no for every student during enrollment. Student information system maintains a comprehensive record on all students in the campus. The module allows the teachers or parents to access the student information by entering their roll no. Brainstem Fee Management module improves the parent’s engagement with the software by making a fee payment and accessing their children performance. It streamlines the fee processing by capturing various types of student fees and assists in the scheduling of fee collection, provides notifications and reminders on unpaid fee, generates periodic reports on total fee collected. It provides role-based access to the users by facilitating the parents to access the fee payments and admin can manage the paid fees and generate the report. Hostel management system is a comprehensive module that covers the number of hostels present in the institution, students accommodated in the hostel, allotted rooms, reserved rooms, fee processing and other hostel facilitates. The module covers various aspects of managing the hostel by avoiding paperwork and providing the security to the stored records. It helps the management to track the daily expenses of the hostel by generating real-time hospital records within a single click. The user can customize the module by defining the hostel fee structure, student information, room allocation, staff information, food charges and more. Brainstem library management system maintains the records of the entire library catalog along with the whole book transactions and availability of books in the library. Categorize the books based on the subjects and departments. Maintain the library records according to the availability of books, magazines, thesis, and newspapers. Facilitates in collecting fine for the late returns. Generates automated real-time reports on the total books, available books, issued books, students’ id, pending returns, issued magazines and more. Import & Export of Books & Members records in Excel Format. Department wise detailed report Collection Summary Report. Course management enables the staffs to create new courses along with its duration, in charge faculty, and other course attributes. It allows students to choose the course along with its associated modules such as timetable, course admission, classrooms and more. Course management provides a comprehensive report on course commencement date, the number of students enrolled, in charge faculties, course overview and more. HR management system provides better data visibility to users by empowering the employees to access their payroll information. It generates real-time records on staff attendance, payroll, and staff performance. HRMS provides authenticated access to the users and enables the employees to obtain leave or salary benefits. Inventory and purchase management handles purchase, stock availability, and consumption details. It handles the movement of stocks between different stores within your institution. It helps to monitor the stock transfer, movement of stocks, stocks issued, and status of stocks. It tracks the internal transfer of stocks within the institution by capturing the entire store details. Transactions Related to Purchase and Transfer. Purchase Status, Item Issue, and Stock Ledger Details. AES Education ERP seamlessly integrates with the effective brainstem mobile application and provides handy access to students or staffs information. It eases the payroll or fee calculation by integrating with the tally software and provides instantaneous notifications through SMS. Brainstem saves paper by storing electronic records on student/staff information and automates the administrative processes. It connects with multiple departments and campuses by supporting the administration to handle the schools or colleges in different locations. It improves the employee performance by facilitating independent access to the staff information and creates employee incorporation with management. With Brainstem mobile application, the user can gain handy access to their data at anywhere and anytime. HRMS module automates payroll calculation and managing of employee attendance. Brainstem cut administrative costs and assists in student development.